I took several photographs of the Primavera tree that you see above. The yellow blossoms are big and beautiful. I can only imagine how spectacular the view is of the Primavera Forest outside of Guadalajara. 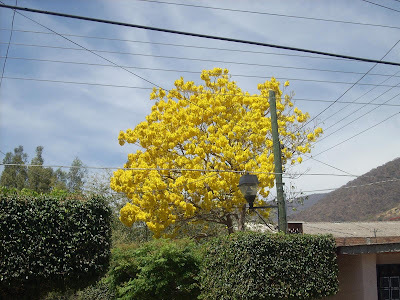 This solitary tree is near the Plaza in the center of Ajijic. Who cares about a little allergy problem when you are surrounded by God's Glory? I praise God, even as I get blisters on my blisters when sweeping up the Jacaranda blossoms from the front of our house and roadway.